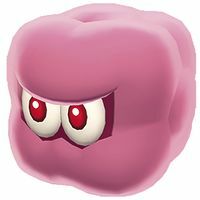 Blurkers are pink, squishy block-like enemies that appear in Super Mario 3D World. They are introduced in World 2-3, Shadow-Play Alley. Blurkers appear in groups and primarily serve as guardians to secret passages. Contact with one will damage the player. They can be temporarily disposed of by any normal means of attack except jumps, or by use of the touch screen and microphone functions on the Wii U GamePad, although they will quickly respawn upon being defeated this way. They can be defeated permanently through use of a Mega Mushroom, a Piranha Plant, White Tanooki Mario or Lucky Cat Mario. Blurkers are also found in the Wii U version of Captain Toad: Treasure Tracker, where they reappear in Shadow-Play Alley. This page was last edited on December 15, 2018, at 21:43.